Having the option of using a Florida Keys airport for your keys vacation, sounds perfect really. Why waste time on the boring aspect of getting to paradise when you can zip straight into paradise and land on your hotels doorstep. But beware it may not be as simple as jumping on a plane and flying all the way through to your resort however. But hey....that doesn't really matter as a trip to the Florida Keys is as much about the journey as it is the vacation itself. Most flights that come into the Florida Keys from anywhere other than the state of Florida will usually have a connection at International Airport in Miami. A number of major airlines have regularly scheduled flights to the Keys, and Key West International Airport and the smaller airport in Marathon are the two main choices you have for these. There are also quite a few smaller carriers which can fly you direct to the Florida Keys from the larger cities to be found in the state of Florida, or further a field in the Bahamas. However, its useful to know that due to strict immigration laws, any passengers flying in from the Bahamas will have to pay a visit to Miami International Airport. Below are details for all of the main carriers that can be used as you make your way into and out of the Florida Keys airport of your choice. Key West airport has really gone through quite a change over the last few years to bring it up to speed, enabling it to deal with the ever increasing passengers that want to fly straight into Key West. A few years back being welcomed to the Conch Republic at this Florida Keys airport was not the most inviting methods you can choose. But now with a refurbishment costing over $31,000,000 you will be delighted with the whole airport. One thing to note if you are considering missing the quite spectacular drive through the Keys on the Overseas Highway, you will highly likely have to change planes, and board a much smaller plane that can use the runway down in Key West. Literally all of these kind of flight changes will occur either in Orlando, Tampa, Miami or Ft Lauderdale. You can however fly directly in, if you board the plane in Georgia, as the service from Atlanta on Delta terminates in Key West. But using a "Puddle Jumper" as these little planes are affectionately known, is just another charming part of getting down to Key West. I like using these planes, it makes me feel like Indiana Jones....ok, ok, I know that sounds mad, but still the old Indy feeling never leaves me. With companies like Seacoast Airlines, the conch based Air Key West and of course American Airlines expanding their fleet flying into Key West you really have more choices available to you than perhaps you would expect in a Florida Keys Airport such as Key West. The link below will take you to a more detailed page providing contact details for all the current charters using this Florida Keys Airport. Marathon airport is known as the heart of the Florida Keys, and its not hard to see why. It really is about as bang in the middle of everything as you could hope to get, which is why those with a private jet or plane make great use of this Florida Keys Airport. With a terminal costing $9,000,000 it doesn't hold up to say, Key West or Miami International but it is getting more and popular each year as its convenience becomes more known. 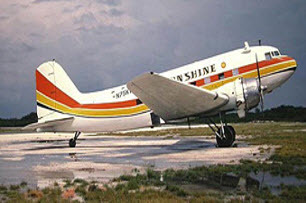 Check out the charters that do use the place like Air Key West, Atlantic Airlines (Florida Air Shuttle) and Gold Aviation as this could well be the Florida Keys airport to head for if you fancy using the island of Marathon as your base to explore from Key Largo down to Key West. So although the information that we are presenting is mainly for the tourist looking for some Florida Keys fun in the sun, at Marathon Airport they do cater for storage and maintenance of privately owned jets. So if you are a pilot, and are thinking of flying to the airport in Marathon then OurAirports.com has great information regarding coordinates, runway length and radio frequencies to ensure that your flight is as stress-free as possible. Although this page is of course all about the two Florida Keys Airports at Key West and Marathon, for those passengers who are flying from further a field, the list below will provide starting points for the services that do run fleets of planes in and out of the Florida Keys. Make sure you click through to the services websites when applicable.